WHEN THE CITY OF EUREKA UNVEILS ITS QUARTER-MILE-long, $7.9 million boardwalk Saturday, it will be a major leap in the city's evolution toward becoming a spruced-up Victorian seaport sparkling with pride. To Mayor Nancy Flemming [photo at right], who has become a political juggernaut in Eureka's beautification community during her 12-year tenure, the compass rose symbolizes the essence of what the city is trying to achieve. "The compass rose not only shows you what true north is, but it also sets direction on all maps. It is an important part of any nautical history. It is very, very important to help find your way, so we think it is a good symbol for the city of Eureka in showing that this is the way. It is really going back to our heritage and celebrating that we are a Victorian seaport. It is an inherent part of what we are," Flemming said during a preview tour in mid-December. The genesis of the boardwalk project was more than a decade ago. In fact in 1990 when Flemming was first elected mayor --53 percent of the vote in the primary running against five opponents -- she ran on a platform of waterfront redevelopment. "I want a very functional waterfront. I want it to be busy and active with people and certainly the walkway will tie all those things together," she told the Journal in a July interview that year. 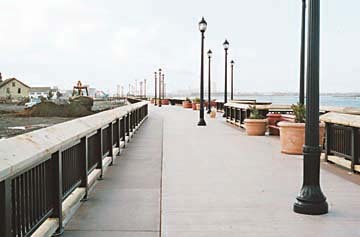 The boardwalk, actually made of concrete, became an integral part of the city's waterfront revitalization plan adopted in 1993. Next came the planning, permitting and pre-construction phase, jumping through the regulatory hoops of overlapping jurisdictions. Finally, finding the funding made the project a reality. 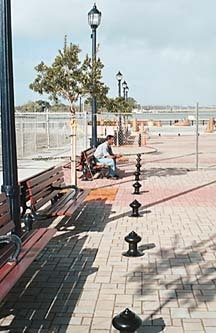 City leaders thought they had financing in place in the fall of 2000 when the boardwalk construction was put out to bid. About $4.5 million had been secured from the California Coastal Conservancy, the Eureka Redevelopment Agency and the Tidelands Trust Fund. An extra $1.7 million was borrowed from a city wastewater reserve fund just in case. But all the money together was not enough to fulfill Eureka's dream of a full-fledged boardwalk. When bids were opened in November, the lowest figure was $2 million more than the engineer's estimate. That's when businessman Rob Arkley and his wife, Councilmember Cherie Arkley, stepped forward with an offer to make up the difference and get the project under construction. "My husband Rob and I gave it to the city because they fell short of their estimate," said Cherie Arkley, who had to recuse herself from voting to accept the money. "Unless the city had that extra $2 million, the project would be dead." Flemming agreed. "That money enabled us to build the boardwalk all the way down to the commercial fisherman's area [C Street]," she said. Without the Arkleys' gift, the funds available would only have been enough to build the central plaza on F Street. While many are giving credit to the Arkleys for their generosity, Arkley points to Flemming. 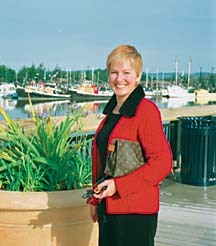 "It was Nancy Flemming's vision to bring people back to the waterfront. She really has spearheaded this ever since she [took] office," Arkley said. 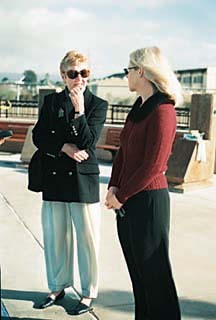 Michele McKeegan, president of the beautification committee (left) and Councilmember Cherie Arkley. Right: tree planting, on city streets and slong the new boardwalk, is a major focus of Keep Eureka Beautiful Committee's efforts. While the boardwalk is probably the most visible project to date in Eureka's efforts to beautify itself, it is far from the only one. And leading those efforts is a council-appointed advisory group that calls itself the "Keep Eureka Beautiful" committee. 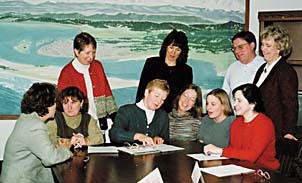 The 15-member panel, nicknamed the KEB, was founded in 1996; its mission was to build civic pride. The committee collaborates with many other community organizations like the city's Design Review Committee, Humboldt Heritage Society, Eureka Main Street Program and Eureka Chamber of Commerce. But one of its critical functions is to advise and support the City Council in enforcing its own landscape ordinance. "They (KEB) are a very respected group. The city listens to them," said Arkley. "KEB goes before the council all the time and they give awards of merit to different business owners around town who pay special attention to beautifying their place. It's just a wonderful group." Michele McKeegan, president of KEB and one of its founders, acknowledged that one of the group's main duties is moral support for city staff. Sometimes, she said, the city needs help encouraging property owners to pay attention to cleaning up and "streetscaping" areas surrounding existing buildings and enforcing the city ordinance that sets rules for landscaping new construction. "With the city, a lot of it is just helping them do what they already want to do in terms of enforcing the landscape ordinance." McKeegan said. "They want to enforce it, but there are a lot of people pulling at them not to do the right thing, like `I want more parking. I don't want landscaping.' There is a lot of pressure on the city not to do the right thing. So I think a lot of what we do is give the city a little support." The Keep Eureka Beautiful Committee: Front row from left, Elizabeth Murguia, Liz Pierson, Michele McKeegan, Lynne Page, Kari Neibel, Charlene Citler-Ploss. Back row, Sue Clinesmith, Stormi Bettiga, Tom Coyle ande Marge Crichton. Elizabeth Anderson in in photo at right. In addition to the boardwalk landscaping advice, over the last two years the KEB has been involved in two other very visible horticultural feats --both involve palm trees. First was landscaping the new county jail, part of the Humboldt County Courthouse complex. Controversial as the jail's palm trees are -- people either hate or love the tropical flora -- it is landscape in the finest Victorian tradition, says KEB member Liz Pierson, owner with her husband Bill of Pierson's Building Supply. Pierson is the one who originally came up with the idea of using palm trees to landscape certain areas in Eureka. Palm trees, she said, fit in naturally with the Victorian landscaping theme that both KEB and the city have in mind. "Eureka really does represent palm trees. That's what the early Victorians planted," she explained. Palms were often barged up here and planted in front of Victorian homes as a status symbol. A look around Eureka reveals a number of well-established large Canary Island date palms, Phoenix canariensis, in local parks and gracing old Victorian homes. The palm trees around the courthouse are actually Mexican fan palms, Washingtonia robusta. While not authentically Victorian Canary Island date palms, Mexican fan palms were chosen because they were economical, hardy and meet specific standards for a city street tree. And while they may look a little out of place, they are historically a correct fit for Eureka, Pierson said. "Palm trees might not make sense in a redwood forest or outside the city limits. But in a city that is totally made up and impacted by man, they do," Pierson said. "The very first trees brought into Eureka were palm trees, once they started to civilize the area and make it into a city. We can deny that heritage, but it is there." But how were the trees chosen for the remodeled and expanded courthouse? First, plans were drawn up by landscape designer Mary Gearheart, who donated her services to the county. Then the plan went to both city and county officials for approval -- with hardy encouragement from KEB. "I had already convinced [4th District Supervisor] Bonnie Neely," Pierson said. "At that time she was on KEB, and so she thought it was a pretty great idea. "Basically, the guys in the county said they could care less. They had no idea about what the landscaping should be. They were getting hell from everybody. They knew they had to plant something." 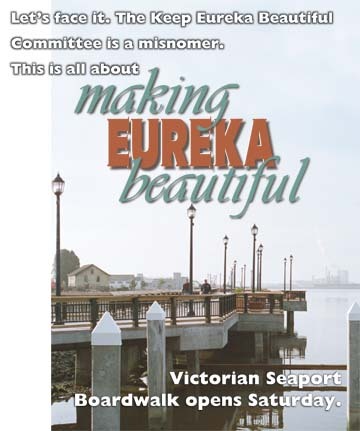 So the lobbying began, which basically consisted of educating decision-makers about the notion of what a Victorian landscape means, "the kind of landscaping you need to make Eureka a Victorian seaport," Pierson said. Former Councilwoman Connie Miller was also on the committee and was committed to the project. Once the city was agreeable, "It was pretty easy to get the county to go for it. Everybody said, `Sure, whatever,'" Pierson said. Prior to the "palming" of the courthouse, Pierson and KEB were busy encouraging Broadway Cinema owner David Phillips to landscape the art deco style building and massive parking lot with palm trees. It was a major victory for KEB, Arkley said. "KEB has to take complete credit for (landscaping) all the concrete in front of the Broadway Cinema. KEB said, `Let's have some landscaping,' and to his endless credit, David did it. He put up all those palm trees, which was terribly expensive." Phillips later was rewarded with a bronze plaque, a KEB award of merit. Each year KEB rewards about a half-dozen other businesses and individuals who go the extra mile to beautify the city with a plaque. The awards are presented at City Council meetings and recipients receive local media coverage. Ultimately the bronze plaques become a part of beautification itself since most become attached to buildings throughout the city. While some KEB victories are obvious, others sometimes go unnoticed. The committee works hard behinds the scenes to reduce the proliferation of billboards. Recently the committee halted new construction of one billboard and had four others removed. "We prevented one gigantic billboard from going in at the south end of town," said McKeegan. "It would have been 32 feet high mounted, 48 feet wide and 14 feet high -- double-faced and illuminated. It would have been the Goliath of billboards. And so we fought that. It was the first time that anybody had succeeded in opposing a billboard around here. That was our first one. "The second one was about six months ago. The city lease came up for a billboard at Henderson and Broadway and three [others] at the south end of town. We went to the city and said `We don't want you to renew these leases.' They voted not to renew. So that's part of what we do. Jump in when we see an opportunity and take it," McKeegan said. But KEB also loses some battles. The group was particularly unhappy about a large advertising sign that went up at the corner of West and Myrtle avenues in a strip mall. The looming sign had a busy cluttered look that KEB found noisome, but the city's Design Review Committee rejected the committee's request that the sign be altered. "Sometimes we don't win," said McKeegan. 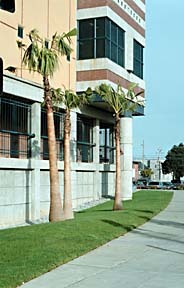 The palm trees in front of the Humboldt County jail in Eureka. There is a precedent for KEB's attempts to improve the looks of the sprawling lumber/fishing town of Eureka. Efforts at city beautification were launched in the late 1950s when a volunteer group formed to encourage the city to clean up and plant trees. Elizabeth Anderson, widow of beautification pioneer Dr. Richard Anderson, remembers there was a lot less to "keep" beautiful when the couple first came to town. "In 1953 it was the dingiest place, the ugliest place I ever saw," she said. "Every store front was just what you would expect of a lumber town. Nobody cared about how things looked. There were no trees and I thought we had come to the land of the big trees." Along with other community members, Dr. Anderson formed a beautification committee and got the city of Eureka to proclaim it as part of the city. Planting trees topped the agenda. "It was either in the late '50s or early '60s," Elizabeth Anderson recalled. "The city raised the funds to plant trees and drill holes in the sidewalks. They managed to get the trees planted on 5th Street." Beautification had begun. Community members planted flowers around the trees and the committee gave out awards. "They just gave pieces of paper and a little publicity. The recipients went down to the mayor's office where he presented the awards," Anderson said. It was a chain reaction: After trees and flowers went in on public property, it encouraged Eurekans to landscape and paint their homes and businesses, Anderson recalled. The biggest accomplishment "was just making people conscious of what a difference a bunch of trees and some plantings about the base made. A lot of people, especially owners on H and I streets, spruced up their dwellings." While the town didn't get a complete facelift, the attention was enough to make the town look noticeably better. The committee lasted until about 1973 when it folded. 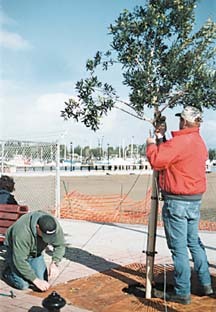 While planting trees is part of the history of Eureka beautification, it is also key to the city's future appearance. Both the city of Eureka and KEB have plans in the hopper to landscape the north and south ends of town and the Broadway corridor with trees as well. The KEB has drafted a resolution to go before the City Council in January that envisions Eureka as a tree-lined city. The plantings could become a sort of panacea for an increasingly urban Eureka, says McKeegan. "You know, if we have big trees on our streets that means that people are more likely to walk on these streets and enjoy them. More people on the streets means they are safer. It means that there is less litter," McKeegan said. "Big trees slow down traffic because it makes the street feel narrower, which means kids can ride on their bikes to school. People start doing up their front yards and making things nice, instead of throwing up walls. For me that's what it is all about. It is a sense of community. People need to understand that beautification is not just a fill-up. It's not an extra added thing you can have or not have. It really is essential." Arguments like McKeegan's bring beautification out of the realm of aesthetics and into the world of economic development -- and those arguments are shared by others. Landscaping with trees, cleaning up the streets and painting buildings are essentials that make a city a desirable place to live and to do business, said Mayor Flemming. "I think there is now a respect for beautification as a word in itself. I think the city of Eureka is very much like a person. We want Eureka to have a real sense of identity," she said. And what might that identity be? "A Victorian seaport," Flemming said. "That ends all barriers. There isn't an Old Town, a Downtown, a Henderson Center. We are all those sections, but we are also one incredible Victorian seaport. And I think when you focus on cleaning up, fixing up, as we have with all of our programs, then you have a city dressed for its interview. "That is economic development. You have to look like you are proud and that you have something to offer," she said. 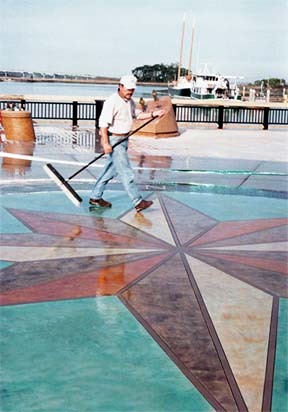 And standing in front of the compass rose on the newly completed boardwalk, preparing to hoist a symbolic ship's lantern during opening ceremonies Saturday, Flemming is a very visible example of that pride. WANT TO GO DOWN in history? Saturday, Jan. 5, is your chance. A community photograph will be taken of all attendees at the dedication ceremony of the new Eureka Boardwalk Saturday, Jan. 5, at 4 p.m. The location is the new F Street Plaza on the waterfront. Speakers will include Mayor Nancy Flemming and state Sen. Wesley Chesbro. There will be performances by singer Donna Landry, the Eureka High School Jazz Band and Eureka High NJROTC. The city fire boat and the Coast Guard ship Barracuda will patrol the waters. The highlight of the ceremony will be the hoisting of a ship's lantern up the new flag-staff and lighting each street lamp one at a time along the new walkway from G to C streets. At the conclusion of the dedication, Eureka Main Street will begin its monthly arts walk, Arts Alive!, through Old Town and downtown. Arts Alive! venues will be open until 9 p.m. (See Arts Alive! schedule.) For more information regarding dedication events, call 441-4144.